Goodness and Mercy Missions empower women with business skills to generate income and educate their children in Cameroon. 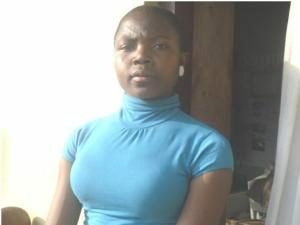 Goodness and Mercy Missions Started sponsoring Sylvia when she was in form 2 at Acha Baptist College, Belo. Now she is at the University Institute of Bamenda. The most interesting thing is that when we first profiled Sylvia her dream was to grow up and become an electrician. Her dream has come true as she is about to graduate from University doing the very thing. Great thanks go to P. Peck in the USA who has been consistent in taking care of Sylvia’s education till date. The loss of both parents would mean the loss of hope for a brighter future for the most Cameroonian children. Especially, when this child is a girl who is left under the care of a poor health grandmother. Diangha Carine who lives in a high density area in Jinkfuin, would not even think of getting any further education, not to mention healthy food and all other essential things. But her dreams came true when she started receiving GMM sponsorship. 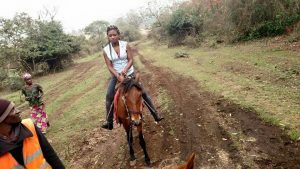 Thanks to her sponsor Erin Ecomeford in USA now she receives all she needs and more – self-confident, belief in a brighter future and trust in people. Through Goodness and Mercy Missions’ Child Sponsorship Program Diangha has learnt that the loss of parents is not the end of everything because there are kind-hearted people somewhere, near or afar, that are willing to make the world a better place. She is so grateful to her sponsor for the love and support that she receives. At the moment Diangha Carine is a happy form 5 student at Acha Baptist College in Belo Cameroon. All her spare time she dedicates to work at the GMM Child sponsorship program. She is supporting and encouraging other less fortunate children who go through difficult times. GMM works in partnerships with representative organizations to help the rural poor and empower the community with tools which they can develop to sustain their livelihood. Our greatest desire is to see rural communities and others have the needed tools and means for a sustainable livelihood. "My name is Teddy Zvirawa, 23 years old I am a volunteer with Goodness and Mercy Missions in Cameroon and I am in Zimbabwe currently studying Bsc Sociology at the University of Zimbabwe. Online volunteering has created a platform for me to put what I am learning to practice because I believe that theory without practice is Pointless and practice without theory is blind. Therefore the online initiative comes handy as I can be able to contribute to sustainable development without necessarily have to travel to the affected area. Instead of saying that one day I will help someone somewhere I can do it right now, this is amazing and fantastic .I actually enjoy contributing meaningful ideas to end poverty. Thus online volunteering is a platform that I was exactly looking for for that I can be able to contribute towards changing the world because I believe it begins with us. Sustainable development can only be achieved through participation and online volunteering has offered me this . Let's continue to change the world." Goodness and Mercy Missions (GMM) located in Boyo, Cameroon, is a nonprofit organization founded in 2007 to provide tools and help to the youth and disadvantaged people in the local communities. It has been carrying out this objective successful by projects on the areas of education, health, youth livelihood programs and focused programs for women. Theme Designed by InkHive. © 2019 Goodness and Mercy Missions. All Rights Reserved.